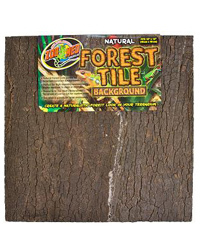 Zoo Med Natural Forest Tile panels for terrarium/vivarium backgrounds. These panels are precut to fit Zoo Med's Naturalistic Terrarium or can be cut for custom sizes. They are perfect for high-humidity environments as they are highly resistant to mold or mildew. Great background, really easy to trim down.